Today, Strawberry Ice Cream sometimes seems boring; a hundred years ago it was very special. When strawberries were in season, it was time to get the hand-cranked ice cream freezer out, buy some ice, invite friends over, and make Strawberry Ice Cream. 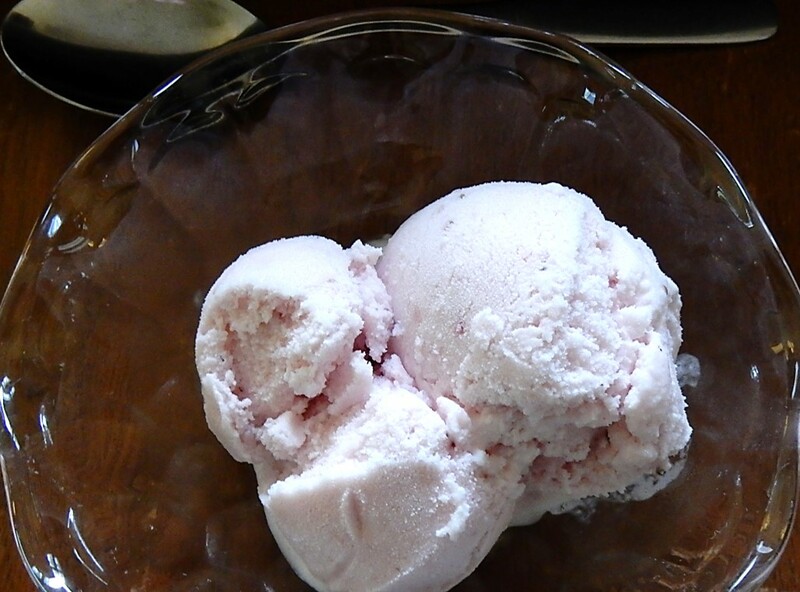 The hundred-year-old Strawberry Ice Cream recipe that I found was easy to make. It only had three ingredients: cream, sugar, and strawberries. And, the ice cream was delightful. This classic ice cream was creamy and infused with the sunny taste of fresh strawberries. There was no comparison to the cheap strawberry ice cream sold in plastic gallon tubs at the supermarket. It was somewhat similar to the higher-priced strawberry ice creams, but it did not contain the large chunks of frozen strawberry puree they often contain. The strawberries in this ice cream are “rubbed” through a strainer, so the pieces of strawberry in the ice cream were tiny which creates a lovely texture. Ice cream that is not eaten immediately can be stored in the freezer. It was extremely firm when removed from the freezer, and should be allowed to warm for a few minutes before attempting to scoop. Wash, hull, and slice strawberries, then mash with a potato masher or pastry blender. Add sugar, and let sit for 1 hour. Then “rub” the strawberries through a strainer or colander . (An old-fashioned, hand-cranked Foley mill works well to do this, but is not needed.) Discard the large strawberry fragments that won’t go through the strainer. Stir the cream into the strained strawberries. Chill the mixture in the refrigerator, then place in ice cream freezer and freeze. Posted on June 12, 2017 June 11, 2017 by SherylPosted in FoodTagged ice cream, strawberries. There’s nothing like homemade ice cream — strawberry and peach are my favorites. This is a nice, easy recipe, for sure. The straining is an interesting touch. I’ve never read of that before. That sounds great, especially as I don’t have an ice cream maker. My Dad’s family used to be in the ice cream business, so we had homemade all the time. Strawberry was my Dad’s favorite. I may have to try this. Sounds great. I love the just three ingredients. Ooh, this sounds good. If I wasn’t allergic to milk, I’d try it in a heartbeat. Do you think you’ll be making homemade ice cream with other types of fruit later on this summer? That’s amazing that the recipe has only three ingredients. It looks lovely. I have a Foley food mill, and what better to use it for than strawberry ice cream? Magnificent. Sounds so creamy and dreamy. It takes me back to childhood when we would haave homemade ice cream. Ahhh Yummy! I do’t normally choose fruit ice cream but the simplicity of this one is very appealing! I just picked about a pint of berries from my little patch out back. I may try this with a little less sugar and almond or coconut milk instead of cream (sorry, I need to vegan-ize your yummy recipes) 🙂 It’s really scary to read all the ingredients on the average store-bought carton, especially carrageenan. Your column always reminds me that simpler was often healthier. If (or when?) you decide to do this, would you share your veganized recipe here? I’d love to try it! Hi Lydia~ I have not had a chance to make this, but what I would do is substitute coconut cream from a 14 oz. can (Trader Joe’s is the brand I use, as it has no additives). Refrigerate the can overnight, then open and scoop out the cream, leaving any residue or liquid behind for future blender drinks. I would try a half-portion first. I have made vegan whoopie pies with this cream and it’s wonderful! Thank you. I’ve saved your instructions and am hoping to try this version of the recipe soon. It sounds really good. This is a wonderful recipe! There was no such thing as half and half back in the old days, be we do have light cream in the dairy section don’t we? I made strawberry ice cream a couple of times, but my recipe called for condensed milk rather than cream. It was pretty good, but I think I’ll try this one. I especially like having the strawberries so small, as a big hunk of frozen strawberry is hard on the teeth! When I think of my dad, I see his hands cranking at the handle of the ice-cream maker and poking the ice down with his fingers. We often had strawberry ice cream, made with the berries from our garden. I am ready to try this! Our family would enjoy the old hand-cranked ice cream freezer in the summer but it was usually vanilla. This one looks easier! Sheryl thank you so much for this walk down memory lane. I am going to share it with my readers as well. I have a lot of fun trying these old recipes, and it’s always wonderful to hear when someone makes one of the recipes I post.